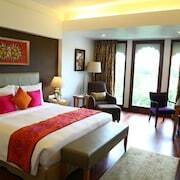 This family-friendly Udaipur hotel is within 2 mi (3 km) of Lake Fateh Sagar and City Palace. Lake Pichola and Lake Palace are also within 3 mi (5 km). Situated in Udaipur, this hotel is within a 10-minute walk of Jagdish Temple and City Palace. 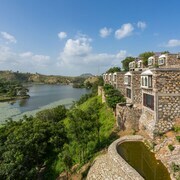 Lake Pichola and Lake Palace are also within 2 mi (3 km). Price is higher, one could get room in 5 stars at same price. The only best thing about the hotel is the location and food. Staff is very helpful. Nice place and nice people. But it is NOT ON THE BANKS OF LAKE PICHOLA like they say it is, and not anthing close to the luxury palace at Oberou Villas next door. Where to find Eklingji hotels near an airport? Where can I find hotels in Eklingji that are near tourist attractions? Planning to visit Udaipur? Looking to book a hotel or apartment within a short drive from the main part of Eklingji? Eklingji offers 2 quality Expedia-listed accommodations within a 0.1-kilometre (0.06-mile) radius of the downtown area. The RAAS Devigarh is nearest to the center of Eklingji and the only hotel that is only a short drive away. 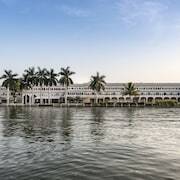 The Taj Lake Palace is 19 kilometres (12 miles) away from the center of Eklingji. 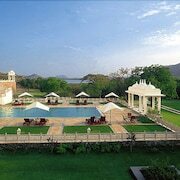 Another alternative is the The Oberoi Udaivilas, Udaipur, which can be found 19 kilometres (12 miles) away. 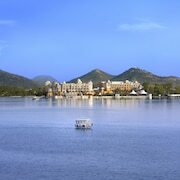 Two more options worth checking out are the The Leela Palace Udaipur and the Fateh Prakash Palace. After you have got to know Eklingji, you should make time visit the other attractions in the North India area. North India offers beaches, coastal plains and forests. Popular North India visitor attractions are ruins and traditional villages. Fun-loving visitors might try their hand at skiing here. Lake Swaroop Sagar is found 18 kilometres (11 miles) to the south of Eklingji. Here, you can visit the Vintage Collection of Classic Cars. Travelers staying in Udaipur City Centre can pick from the following; the Shiv Niwas Palace and The Lalit Laxmi Vilas Palace. While exploring the Udaipur region, why not visit Lake Swaroop Sagar, the proud home of the Garden of the Maidens. Lake Swaroop Sagar is located 17 kilometres (11 miles) to the south of Eklingji. The Fateh Garh and Chunda Palace are comfortable places to stay in Lake Swaroop Sagar. If you are flying into or out of Dabok Airport and would like to stay nearby try OYO Rooms Udaipur Airport or United-21 Lake City Resort. What are the most popular Eklingji hotels? Are there hotels in other cities near Eklingji? What other types of accommodations are available in Eklingji? Explore Eklingji with Expedia.ca’s Travel Guides to find the best flights, cars, holiday packages and more!